The First Baptist Church is one of many stone structures on Amherst's main street. According to Dr. Graham P. Hennessey, "The Micmac name was Nemcheboogwek meaning 'going up rising ground', in reference to the higher land to the east of the Tantramar Marshes. The Acadians who settled here as early as 1672 called the village Les Planches. The village was later renamed Amherst by Colonel Joseph Morse in honour of Lord Amherst, the commander-in-chief of the British Army in North America during the Seven Years' War." The town was first settled in 1764 by immigrants from Yorkshire following the expulsion of the Acadians, with the original settlement being located 3 kilometres (1.9 mi) southwest of the present town on the shore of the Bay of Fundy. These settlers were joined by United Empire Loyalists (Loyalists who fled the American colonies during the American Revolution). A mill was built on the current townsite, and the residents moved there to be closer to work. During the 19th century, Amherst became an important regional centre for shipbuilding and other services to outlying communities. An indication of the town's importance in Canadian history is seen with its four Fathers of Confederation: Edward B. Chandler, Robert B. Dickey, Jonathan McCully, and Sir Charles Tupper. During the late 19th century, local industrialists and entrepreneurs constructed many fine Victorian and Edwardian homes along Victoria Street East, leading toward the farming hamlet of East Amherst. Many notable residents have lived in this district, including Tupper, Senator Thomas R. Black, the Barker Family, the Lamy Family, the Pugsley Family and Mary (Molly) Simmons Critchley. Amherst gained brief notoriety in the late 19th century as the location of alleged poltergeist phenomena afflicting Amherst resident Esther Cox in 1878 and 1879, which became known as the Great Amherst Mystery after the publication of a popular book on the affair. Amherst experienced unprecedented industrialization in the late 1870s after the Intercolonial Railway of Canada constructed its main line from Halifax to Quebec through the town in 1872. The location of the railway line away from the Bay of Fundy coast further consolidated the town at its present location as industry and commercial activity centred around this important transportation link. The economic boom created by the arrival of the Intercolonial Railway lasted through World War I and numerous foundries, factories and mills opened, giving rise to the nickname "Busy Amherst". In 1908, the manufacturing output of Amherst's industries was not exceeded by any centre in the Maritime Provinces. Many of the fine old buildings along Victoria Street are considered industrial artifacts because they were constructed during a period of tremendous industry growth. Local contractors employed local craftsmen, who used local materials. Notice the emphasis on sandstone and brick, both locally produced and delightful detail which reflects the skilled craftsmanship prevalent in the 19th century. Amherst's prosperity would not last as the failed economic policies of the federal and provincial governments, coupled with World War I, saw the town's industrial economy begin a slow decline during the 1910s. A prisoner-of-war and enemy alien camp was set up at Malleable Iron Foundry in Amherst from April 1915 to September 1919, and Russian revolutionary Leon Trotsky was incarcerated there for one month after he was arrested in Halifax, Nova Scotia in April 1917. Trotsky was transferred to the isolated Kapuskasing Internment Camp in northern Ontario until his release and expulsion after Soviet Russia signed the Treaty of Brest-Litovsk, ending their involvement in the war. During the Amherst general strike in 1919, worker unrest over social and economic conditions led to mass protests in sympathy with the Winnipeg general strike. The eventual closure of companies such as Robb Engineering & Manufacturing (purchased by Canada Car and Foundry and then closed) and Amherst Pianos, among others led to a resignation of lost dreams as the town was overtaken by other newer manufacturing centres in central Canada during the 20th century. Amherst had a modest-sized industrial park constructed during the 1960s when the Trans-Canada Highway was being developed. Today the majority of the town's major employers are located there, including Emmerson Packaging and IMP Aerospace. During the Second World War, the Royal Canadian Navy named a Flower-class corvette HMCS Amherst. The town is currently served by Via Rail's Halifax-to-Montreal train Ocean. 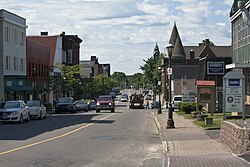 Amherst is the retail centre for the Cumberland region and the southeastern part of Westmorland County (New Brunswick). The town has several national retailers including Walmart, Sobeys, Atlantic Superstore, Canadian Tire, Kent Building Supplies, Giant Tiger and Dollarama in addition to fast food restaurants and auto dealerships. The Amherst Centre Mall is home to retailers Coles, Northern Reflections, Marks Work Wearhouse, Eclipse, and Charm Diamond Centres, as well as the Amherst Artisan Gallery. The heritage downtown draws visitors to specialty retailers Deanne Fitzpatrick Studio, Mrs. Pugsley's Emporium, and Birkinshaw's Tea Room. Dayle's Grand Market houses several businesses in a historic department store with a grand staircase and tin ceilings. Shops include an antique coin dealer, a vintage clothing shop, a ladies clothing and shoe store, and a collaboration of more than 100 local artisans. Amherst is home of the Amherst Ramblers, a Junior A Hockey League team from the Maritime Hockey League. All home games are played out of the 2,500 seat Amherst Stadium. The season usually runs from mid-September to early March every year. The Ramblers draw some of the largest crowds in the Maritime Hockey League, and have placed third in average attendance over the past few years. They won the Centennial Cup in 1993. Amherst is home to a popular running club known as the 'Amherst Striders' that are recognized at almost every race in the Maritimes. Amherst Striders meet 3 to 4 times a week, do not charge any membership fees and open to anyone interested in running and living a healthy lifestyle. Every August, Amherst hosts an eight-team little league baseball tournament, featuring four teams from New England. Amherst experiences a humid continental climate (Dfb). The highest temperature ever recorded was 34.4 °C (94 °F) on 18 August 1935. The coldest temperature ever recorded was −37.2 °C (−35 °F) on 18 February 1922. In the 2016 Census of Population conducted by Statistics Canada, the Town of Amherst recorded a population of 9,413 living in 4,372 of its 4,745 total private dwellings, a change of −3.1% from its 2011 population of 9,717. With a land area of 12.07 km2 (4.66 sq mi), it had a population density of 779.867779.9/km2 (2,019.8472,019.8/sq mi) in 2016. Russian revolutionary Leon Trotsky was once incarcerated in Amherst for one month during the end of the First World War. English novelist Wyndham Lewis is reputed to have been born on his father's yacht in Amherst's Cumberland Basin. Amherst is served locally by EastLink TV. 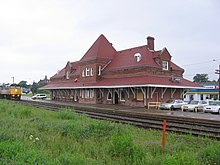 The station also serves the communities of Springhill, Oxford, and others in the county, as well as Sackville, New Brunswick. ^ Hubbell, Walter (1882). The Haunted House: A True Ghost Story. New York: Brentano. Archived from the original on 2009-07-14. 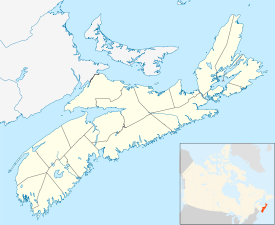 ^ a b "Nappan CDA, Nova Scotia". 1981–2010 Canadian Climate Normals. Environment Canada. Retrieved March 24, 2015. ^ "Daily Data Report for December 2008". Canadian Climate Data. Environment Canada. Retrieved 2 September 2016. ^ "Daily Data Report for October 2010". Canadian Climate Data. Environment Canada. Retrieved 2 September 2016. ^ "Daily Data Report for March 2012". Canadian Climate Data. Environment Canada. Retrieved 2 September 2016. ^ "Daily Data Report for February 2016". Canadian Climate Data. Environment Canada. Retrieved 2 September 2016. ^ "Nappan Auto". Canadian Climate Data. Environment Canada. Retrieved 2 September 2016. ^ Richard Cork, "Lewis, (Percy) Wyndham (1882–1957)", Oxford Dictionary of National Biography, Oxford University Press, 2004. ^ Climate data was recorded at Nappan, located approximately 9 km southwest of Amherst. Wikivoyage has a travel guide for Amherst (Nova Scotia). Cumberland County Genealogical Society - Amherst - The Local Newspaper Compares Amherst and its newspaper in 1939 and 1914.